Theatre Square was shaped in the second part of the 18th century. It was the venue for popular festivals, amateur performances and mounted games with the­atrical elements. In 1765, a wooden theatre was built there. Between 1775 and 1783, the Bolshoy or Stone Theatre was erected by the design of Antonio Rinaldi. For a long time the Bolshoy ranked with the best theatres of Europe and remained the largest theatre in Europe. The theatre was rebuilt many times, burnt down and rected again from the ashes. Operas, ballets and plays were staged at that theatre. Its auditorium had three tiers and accommodated about 2,000 specta­tors. But it was rebuilt in the first decade of the 19th century by Jean-Francais Thomas de Thomon. Then the St Petersburg Conservatoire was housed in this building. The first institution of higher musical education in Russia was founded in 1862 on the initia­tive of the composer Anton Rubinshtein. Pyotr Tchai­kovsky was one of the first graduates of the Conserva­toire. Many outstanding composers and musicians, in­cluding Sergey Prokofyev and Dmitry Shostakovich, studied in it. In 1944, the Conservatoire was named af­ter the great Russian composer Nikolay Rimsky-Korsakov. Next to the Conservatoire there are two monuments to two outstanding Russian composers. The monument to N. Rimsky-Korsakov was designed by sculptors Veniamin Bogolyubov and Victor Ingal and erected in 1952. The monument to Mikhail Glinka is the creation of the sculptor Robert Bakh. It was mounted in 1906. 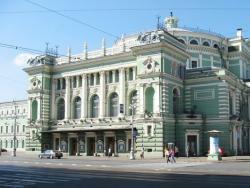 Opposite the Conservatoire stands the Mariinsky Theatre. Between 1847 and 1849, a circus-theatre was built on this site. After the fire of 1859, the building was reconstructed according to the design of the archi­tect Albert Kavos. The appearance of the building, its main facade is a result of the reconstruction undertak­en between 1894 and 1895 under the supervision of the architect Victor Schroter. The new theatre was named the Mariinsky Theatre after Maria Alexandrovna, the wife of Alexander II. The theatre was inaugurated on the 2nd of October, 1860 with the opera “Life for the Tsar” (“Ivan Susanin”) by Mikhail Glinka. Fiodor Shaliapin, Leonid Sobinov sang on the scene of this theatre. Anna Pavlova, Tamara Karsavina, Mathilda Kshesinskaya, Vaslav Nizhinsky, Mikhail Fokin, Galina Ulanova and other outstanding actors danced here. Many works by the greatest composers were performed on its stage for the first time. For several years the ballet company was headed by Mau­rice Petipa. The stalls and five circles of the auditorium have 2,000 seats to accommodate spectators. The Mariinsky Theatre is famous all over the world by its preserved traditions of Russian classic ballet.